It’s a really ambitious vegetarian cookbook PACKED full of recipes - more than 125! In fact - all developed, styled and shot by Ryan and Adam themselves. 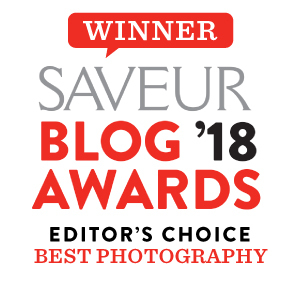 The photography is hence in keeping with their bright, cheerful and colourful style which you might be familiar with from their Saveur nominated blog, Husbands That Cook. There are also lots of adorable anecdotes sprinkled throughout the book, as well as really sweet personal pictures allowing you to feel connected to them as well as their food stories. 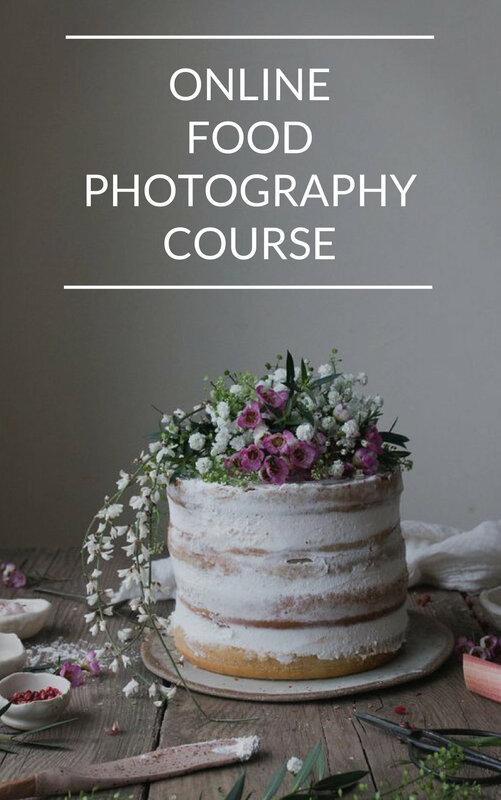 You can actually hear Ryan and Adam talk about their cookbook writing process on the Eat, Capture, Share podcast if you’re curious. The dessert section is INCREDIBLE! I cannot tell you how many of those cakes I’ve earmarked with the cinnamon crumb coffee cake being my absolute favourite. My son loves the idea of the sweet and salty cake, which is decorated with chips (or crisps if you’re UK based like me). I’m also in awe of the schokoladen cake, which is an 8-layer cake that looks to-die-for, yet somehow totally achievable. There are countless cocktail recipes, soup recipes as well as savoury recipes to get excited about as well. In fact, I almost made the vegan banh mi sandwich with crispy tofu for the blog today and, truth be told, you guys actually voted for that recipe over the granola recipe on instagram a few weeks ago. But I decided to go with the granola recipe anyway because I knew I could give it a seasonal twist ;). Please forgive me. BTW I’m glad I did because the granola is SO delicious and I’m confident you’ll love it too! THIS COMPETITION IS NOW CLOSED! All you need to do for a chance to win is tell me: What makes a cookbook great? Please be quick with your answers, entry to this giveaway closes at midnight (Greenwich Time) on Friday, April 19th, 2019. The winner will be picked and notified within a week of the closing date. Please note that this competition is open to residents of the USA and Canada only. Therefore, I'd be super grateful if you can be clear when you comment whether you live in the USA/Canada or not. And even if you don't, please still feel free to let me know what your the cookbook scene. I'd love to know. Good luck. THE WINNER IS CHERLYN. CONGRATULATIONS. This recipe is adapted from Husbands that Cook’s debut cookbook where it is called chunky apple spice granola. The recipe is super easy to make and utterly delicious. Please don’t be put off by the long list of ingredients - they are all staples you’ll definitely have in your cupboards. I added the poached rhubarb to bring it into season, but you can replace the rhubarb with any other seasonal and local fruit if you like, a tart fruit will work particularly well here, or leave the fruit out altogether. My only regret was not making more and I’d definitely recommend you double the quantities outlined below, especially if you’re a regular granola eater and/or have a household of 3+ people. Preheat the oven to 150C-/300F and line a baking tray with non-stick parchment paper. In a large mixing bowl, combine the oats, nuts, spices and salt (if using). In a small, separate bowl mix together the oil, sugar, vanilla and maple syrup and whisk until blended. Pour the wet mixture over the oat mixture and stir well with a wooden spoon until combined. Next, evenly spread the granola mixture on the prepared baking sheet and bake until crispy and golden, around 45 minutes. No need to stir the granola as it bakes as this will stop it from clustering together. 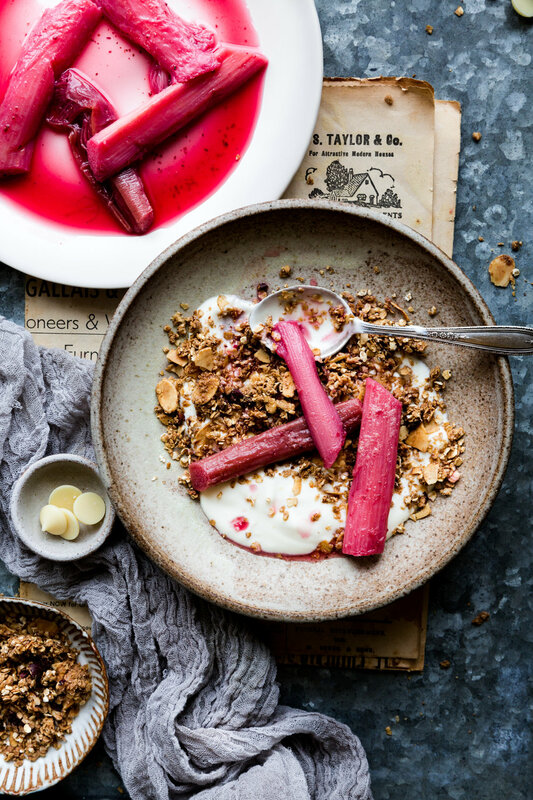 Whilst the granola is in the oven, prepare the poached fruit, by placing the rhubarb, apple juice and hibiscus (if using) in a pot over a low to medium heat and poach for around 10-15 or until the rhubarb is soft and the juice is starting to thicken slightly. For the fruit to cook through evenly, ensure that the rhubarb is completely covered by the juice! Once done, remove from the heat and set aside. Once the granola is done, let the pan cool on a rack until it is cool enough to handle by hand and can be broken into clusters. Then add the white chocolate (if using). Serve with yoghurt and the poached rhubarb or let it cool completely and store in an airtight container at room temperature. Tip 1: Use glutenfree oats to make this recipe glutenfree. Tip 2: There will be a little more rhubarb here than you need, so store any access in the fridge and use within 3 days. Looking for more vegan breakfast recipes? Then click here.